Manufacturers of structural adhesives and construction products. 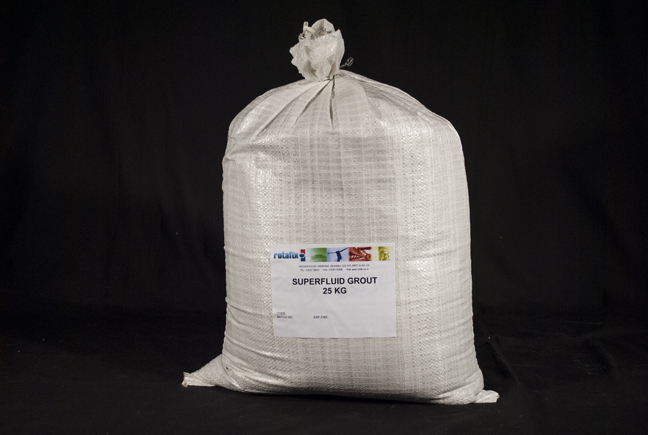 Rotafix Superfluid Grout is a specially formulated, pre-mixed, ready to use, cementitious grout powder used when the repair materials need to permeate into small cervices, crack and spaces. All the admixes and modifications have been pre-mixed soyou have a raw material that once you have added the pre-determined amount of water will give you a consistent batch time after time. The material is a blend of fine cements, high quality graded sands and a set of admixtures. The compound readily mixes with water to produce a grey, anti-shrink, fluid flow grout which hardens to give a strong bonding, high strength product. The grout powder is packaged in 25kg moisture proof, durable bags and has a shelf life of 5 years. Designed to the Department of Transport Specification for Highway Works. Portland cement based, microsilica enhanced and shrinkage compensated. Quickly and easily mixed with water. Fluid flow consistency promotes penetration into confined spaces, cracked surfaces, and damaged concrete substrates. The grout will not segregate or bleed, and is readily pumpable. The grout develops excellent bond strength, and develops good mechanical strengths. Formulated using low alkali cements; equivalent sodium oxide content below 3.0kg/m³. Incorporates non reactive graded sands safe from Alkali Silica Reaction (ASR). High yielding, economical, non flammable, non toxic, odour free, user friendly and safe to use. For the repair and protection of reinforced concrete structures. For the filling and sealing of voids, and general purpose grouting. Load bearing applications: under heavy machine baseplates, structural baseplates, bridge bearing seats, crane rail tracks, generators and compressors where high compressive loads are present. Holding down assemblies, anchor bolts and starter bars where a secure fixing is required.